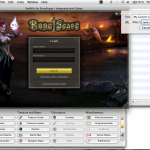 If you’re a Mac user and you play RuneScape then chances are you have looked at SwiftKit praying for a Mac OS X version, but got delivered that dreaded “SwiftKit is Windows only, there will never be a Mac version” answer. Let me take you back roughly 18 months. 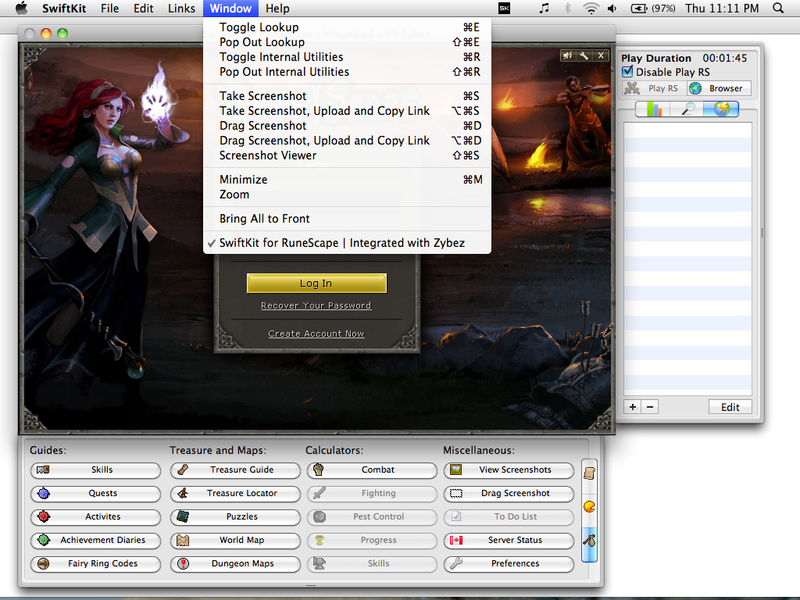 I was exactly the person I described above, looking multiple times for a SwiftKit version for the Mac. 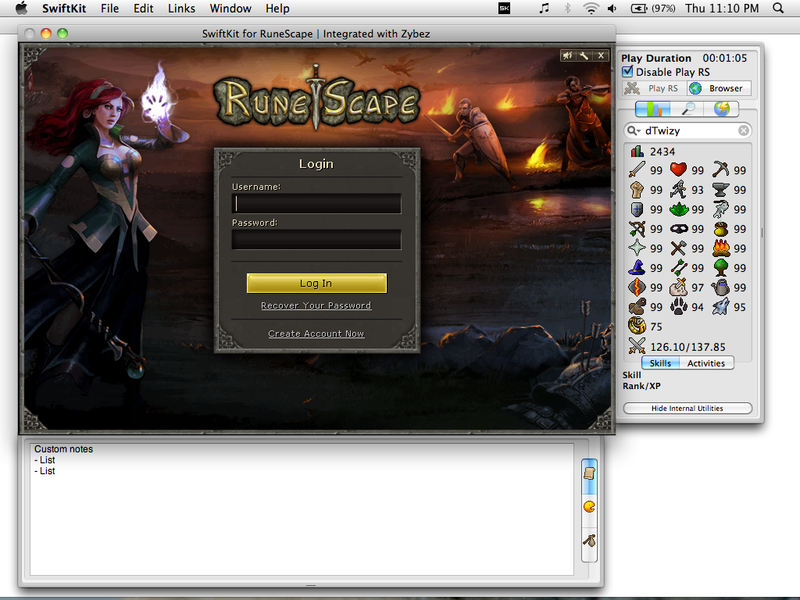 Mac users will know what I’m talking about here, but if you have ever tried playing RuneScape through a browser and browse the internet at the same time it is very unstable and the browser sometimes crashes, ending both your RuneScape and web browsing adventures. 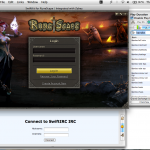 I had waited long enough and decided to put an end to this myself by creating an Application that was simply a website that loaded the RuneScape homepage – keeping my ‘scaping and web browsing to separate Applications. 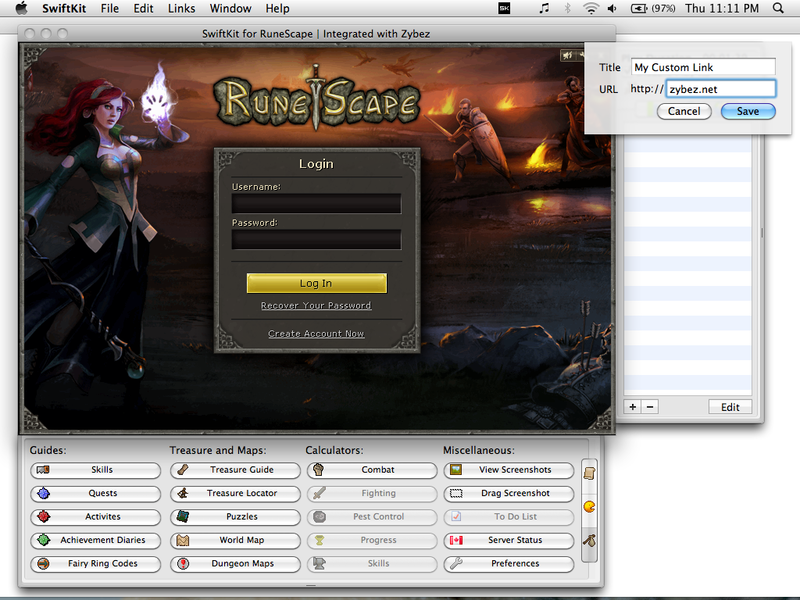 It worked very well, and if the browser crashed it would no longer take RuneScape with it. 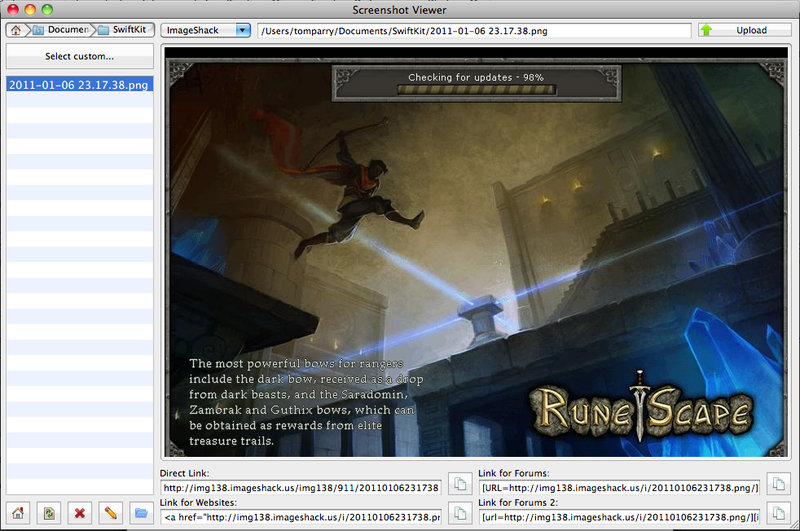 This simple client was pretty much a mimic of the official RuneScape client Jagex released. It was written in Objective-C, which is the standard programming language for all things Mac. At this stage I barely knew anything about Objective-C so it was a stretch for me doing what I actually managed to do. I used this client privately for 6 months, before somebody from Runescape Community (Maxman) messaged me asking about RuneScape on his newly acquired Mac. I sent him a version of my private client, which a few days later I posted in the programming and web development section and created a SourceForge page for. As it gained popularity the suggestions were always the same, which as you can probably guess was the suggestion of a highscore lookup feature. I ended up teaching myself the bare bones of Objective-C to get this implemented (it was also my most desired feature too). This version remained the same for about 7 months (with a few minor updates when new skills/minigames were released). There are probably quite a few Mac users reading this right now that actually use that version to play. After finishing a unit in mobile development at Uni, my name came up when my lecturer’s friend was looking for a developer. 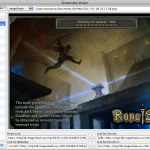 This job was coding for the iPhone – in Objective-C. A few months later I decided to recode my RuneScape client project from scratch, as the older code was horrible compared to what I had learned at work. I recoded it including a price lookup and a custom links section, very similar to SwiftKit… which is what I’m getting to. In the past few weeks I have been adding some additional features bringing it up to par with the Windows counterpart in terms of basic features – and a few extras (get working Strider, *whip*). As development is now coming to an end you can prepare to see an open beta released very soon, so keep an eye on www.swiftkit.net! Don’t get too excited now, but here’s a few pictures. As the development is now coming to an end you can prepare to see the it released very soon, so stay tuned. 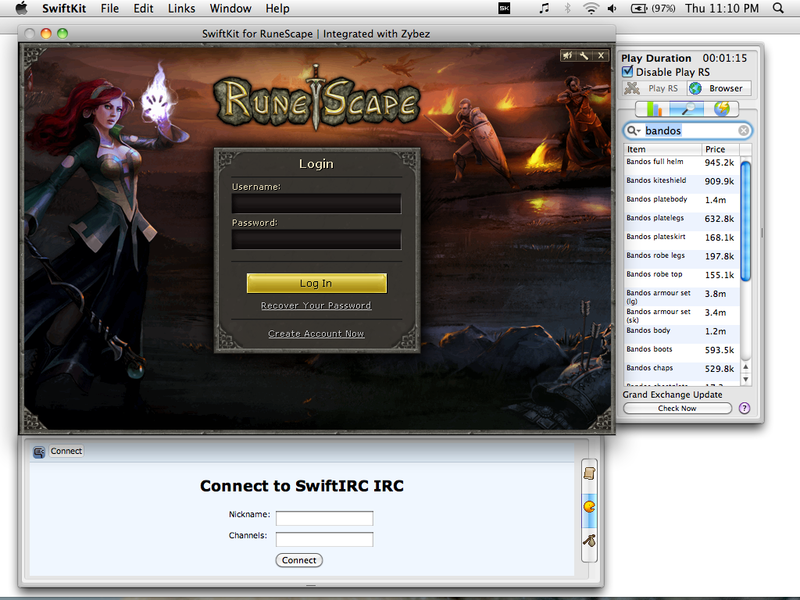 Don’t get too excited now, but here’s a few pictures.If you’re a Mac user and you play RuneScape then chances are you have looked at SwiftKit praying for a Mac OS X version, but got delivered that dreaded “SwiftKit is Windows only, there will never be a Mac version” answer.